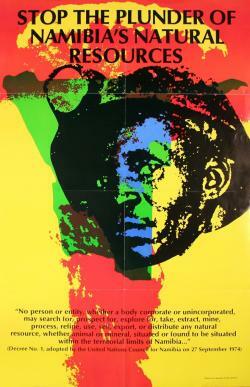 Poster about hearing held at United Nations in New York July 7-11, 1980 on the extraction of Namibian uranium. The poster includes text from Decree No. 1, adopted by the United Nations Council for Namibia on September 27, 1974. Poster also was included in a United Nations resource packet, "For Self-Determination and Genuine National Independence for Namibia." Size: 24 x 36 inches.